Which Organ is Right for Me? 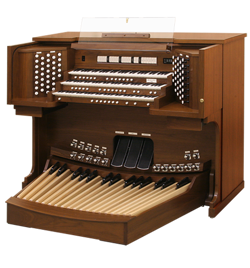 Allen Organ provides three lines of classical organs for the home and the church. Each line is intentionally designed to provide maximum value for the specific need while never sacrificing the construction or tonal quality expected from an Allen Organ. You can click on any line of organ to browse the models, or keep going to Section 3 at the bottom of this page. 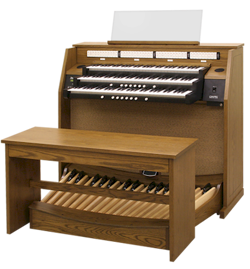 The Historique organ series is designed specifically for smaller environments. This series offers the flexibility of up to four organ suites on the smallest organ, or up to nine on slightly larger Historique II and Historique IIIa organs. These organ suites have been sampled from world-famous classical and theatre pipe organs and are the same as those used in the larger, traditional Allen Organs. These organs utilize self-contained speaker systems for simple installation. 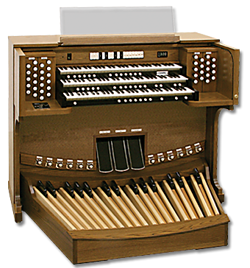 Chancel instruments make it possible for customers with limited budgets to enjoy the legendary sound and quality that has made Allen the most chosen church organ. With an array of customizable features, these organs offer a tremendous lasting value, advanced technology, and rewarding playing experience. These organs can be outfitted with both internal or external speaker systems to provide a full sound in both small and very large environments. These organs can be fitted with either LED stop controls or premium moving drawknobs. Bravura instruments are the most customizable and exquisite classical organs built by Allen Organ. These instruments feature advanced sampling methods, handcrafted console construction, and an almost unlimited number of options to fit your individual and discriminating needs and tastes. With both LED stop controls or premium moving drawknobs as an option, these instruments offer a striking beauty and can be customized to match the colors and even architectural style of your worship or home environment.